Breaking up isn’t easy. And, if you are using Mailchimp for Shopify, you’ve already learned the news: Mailchimp and Shopify are getting a divorce. The bottom line is that MailChimp will cut off native integration with Shopify as of May 12th, according to a statement they released on March 22nd. 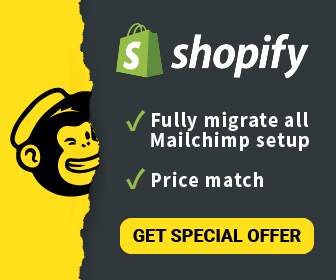 For Shopify merchants using Mailchimp, this means that you are left in need of an Mailchimp alternative for Shopify — fast. The good news is that there are more fish in the sea and Mailchimp alternatives for Shopify merchants. Marketers currently using Mailchimp for Shopify now have the perfect opportunity to upgrade to ContactPigeon. Our app’s deep data integration to Shopify allows you to be able to execute everything you were doing with Mailchimp — and much more. Our platform offers more robust omnichannel features that Mailchimp can’t. This means a wider reach to your potential customers and higher sales. Better still, we offer you our full-migration support for a seamless, smooth, stress-free transition. Have we piqued your interest? Read on for more details. What does the Shopify and Mailchimp break up mean for merchants? Moving on is hard to do, however, if you have been using Mailchimp for Shopify, it is no longer a viable option to keep your brand competitive and relevant. Here are two reasons why. The loss of data integration between Shopify and Mailchimp means that you can no longer create data-driven campaigns. This is because you no longer have access to real-time APIs that integrate with your CRM, CMS, and other marketing tools. The fact that mailchimp and shopify are not synching means that you can’t create responsive email campaigns that target and engage customers with the most up-to-date information. The loss of real-time data integration means you can’t send campaigns such as Back-in-Stock or recommend cross-sell products with data directly from your product catalog. Cross sell product recommendations for use within email campaigns. It’s a fact: campaign messages are more effective when they are tailored to your customers, and optimally timed. Since Shopify merchants can no longer use the native Mailchimp app, you’ve lost a crucial bridge to connect your visitor web behaviors and ecommerce history to determine optimal moment to trigger your messages. Without data integration, even the basic function of adding a new subscriber is at risk. Moving on after a break up can be overwhelming. ContactPigeon is making it easy for Shopify stores to not only move on from Mailchimp, but to move up as well. We offer a dynamic automated platform, that focuses on empowering your eCommerce sales. It’s more than just email marketing. ContactPigeon’s Shopify app connects the data you need to boost online sales. And in turn, allows you to use these data to generate super personalized messages via email, push notifications, SMS, within the website or other integrated channels. We’re making Mailchimp migration stress-free and affordable. If you are ready to attract and retain customers like never before by tapping into deep data analytics and marketing automation tool, take a look. Migrating from Mailchimp is easy-peasy with ContactPigeon’s White Glove assistance. We take out all of the hard work for you and promise a smooth transition to our marketing platform. Our Customer Success team has the experience to quickly and efficiently executes your Mailchimp migration. This includes all of your setups such as email templates, contact lists, signup forms, automation sequences (abandoned cart, back to store), and more — we’ve got you covered. All you need to do is start taking advantage of ContactPigeon’s deep data integration to Shopify and watch your ROI skyrocket. Special circumstances call for special offers. Don’t worry. This break up won’t break your wallet. We offer a special price match for customers impacted by the Shopify / Mailchimp breakup. Our promise to you: If you’re currently paying $150 per month or more with Mailchimp, we’ll match that pricing for your first six months after signing up with us. Isn’t it time you made an upgrade to your current eCommerce Shopify app? Migrating to our “pigeon coup” guarantees you’ll have all the features you currently use with Mailchimp — and more! Migrating from Mailchimp to ContactPigeon means you immediately have access to triggered eCommerce scenarios. Along with alternative messaging channels outside of just email marketing that you can use within automation flow. These include web push notification, SMS, Viber / WhatsApp, dynamic popups, landing page personalization and more. See here for a more detailed comparison between ContactPigeon and Mailchimp features. We’ll help you capture, nurture and convert your visitors throughout the entire shopping journey — automatically. Ok, I’m interested, anything more? ContactPigeon offers its customers the latest technology in automated marketing tools to help you capture valuable insights on your visitor data, personalize your marketing, and grow your business — fast. We acknowledge that there is a lot of planning and consideration along the way to set up a high converting customer journey, and is willing to work with along the way. Our team of pigeons is dedicated to putting our customers first. In fact, that’s how our Customer Success team measures their success — through the satisfaction of helping our clients grow their business. We are all about taking the complexity out of the equation to create simple tools for marketers to easily navigate to boost business. We’ll always roll out our White Glove assistance — starting with your Mailchimp migration, and every day forward from there. We designed ContactPigeon for marketers. That means no coding required with our drag and drop editors for setting up your email, pop-up, landing page, and automation flows. Did we also mention that with your ContactPigeon subscription, you have access to 100+ free template designs? All of our templates are responsive and optimized to ensure your brand and style always looks awesome. Just a few clicks is all it takes! Segmentation allows marketers to reach their customers with personalized, relevant messages at the optimal time. With ContactPigeon, you can segment your contact list by any combination of attributes such as gender, geolocations, similar interests, demographics, activity, purchase history, and more. The segments are updated with real-time data, so you are always targeting the right audiences for every campaign. For Shopify merchants on Mailchimp, this is the perfect opportunity to completely change your eCommerce marketing experience — for the best. Migrate worry-free to our pigeon coup and try ContactPigeon today. Experience first-hand our dedication to improving and empowering ecommerce growth via scalable personalized customer engagements across all channels. We look forward to welcoming you to our nest and getting you set up with our awesome advanced analytics, unique personalization, dynamic segmentation tool, and powerful automation! To get the price match offer? Sign up to speak to a migration specialist or try our app.